Ava from Ava Robotics, a startup with deep technical ties to iRobot, brings her charming personality to the telepresence marketplace. Ava Robotics, a startup with strong technical ties to iRobot, just announced its telepresence robot. Her name is Ava, and she’s likely to win a lot of hearts. For one thing, Ava is quite perceptive, using video technology from Cisco and integrating with Cisco Spark (which provides tools for team messaging, online meetings, and white boarding). Ava is also quite friendly. She allows her users to participate in remote meetings, wander down hallways at other facilities while chatting with colleagues, and enjoy face-to-face discussions with people who may physically be thousands of miles away. 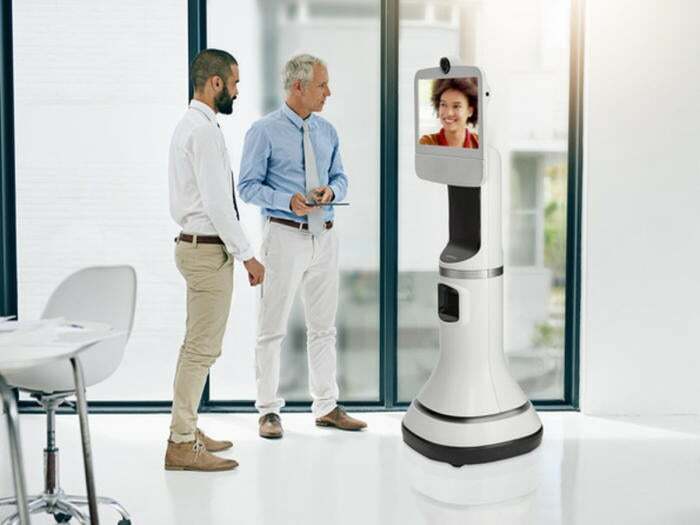 Telepresence robots provide a lot of benefits to companies that are spread across many locations — especially those spanning continents — or with staff who work from home. They make work relationships considerably more productive — even for individuals who may have never met in person. Carrying on casual conversations and checking remote data centers and manufacturing facilities (sometimes safer than being there in person) can make huge differences in how staffs coordinate and get important work done. People can see more than what some particular camera might be focusing on — sometimes referred to as the "expanded view"
In addition, if the screen on the device is pretty much at eye level and the display allows the controller's head to be a normal size, the staff at the site being visited will find interacting with the user's presence in his robotic self to be more natural and comfortable. Ava's creators realized that staff's work doesn't all get done around conference tables and that trust, confidence, and coordination are built over the span of many small interactions. They designed Ava to allow these important interactions to happen even when the team is widely spread. High-definition video and audio conferencing with end-to-end security. This includes a 360° camera. Integrated Cisco Spark video applications. A user experience that allows users to feel as if they are physically on site. They can look around, move, and sit (lower the height of the screen) or stand. Ava’s multiple high-definition cameras make the experience more realistic. Ava can map the environment and then use its AI to safely navigate around the remote office space. There is no need to actually drive the robot or to understand the remote location's layout. Ava will manuever itself to the location that you select when connecting. This may be a conference room, for example, or a colleague's office. Ava will park itself — returning to its charging station — when the telepresence session is done. Using the Ava Robotics app available for Apple iOS and web browsers, users can move around a room and participate in side discussions. Want to know more about Ava? The best way to understand how Ava could help your staff work more effectively would be to take a test drive. Reach out to Ava Robotics if you'd like to know more.